nated by 0° particles, although there is a significant return flux at 180°. After the crossing, the electrons have pitch angles near 180° with virtually no flux at 0°. 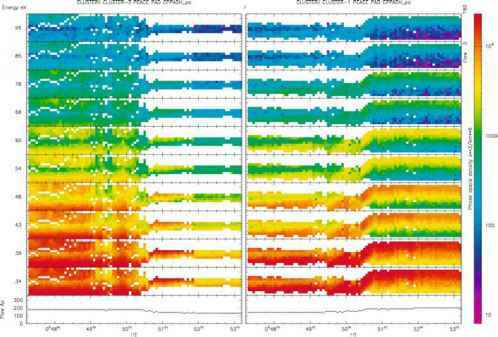 Thus, the Cluster observations are consistent with the findings from ACE. analysis. In the time interval 00:45 UT-00:55 UT, a minimum variance direction (-0.36, -0.69, -0.62) was obtained. In the interval 00:00 UT-02:00UT the minimum variance direction was (0.44, 0.66, 0.62). The mean field in the minimum variance direction, (B • n) was 0.1 ± 0.4nT, identifying the HCS as a tangential discontinuity since no magnetic field threads the HCS. The solar wind velocity (-450,10, -2) km s-1 measured from the CIS/HIA instrument is fairly constant during the HCS boundary crossing. Its projection onto the discontinuity normal yields ~ 190 km s-1. If compared to the normal speed in Table 1.1 one concludes that the HCS is not propagating in the solar wind rest frame, which is consistent with the conclusion that the discontinuity is tangential. The main change in field angle occurs over ~ 22 s, corresponding to a thickness of a few 1000 km. Table 1.1. 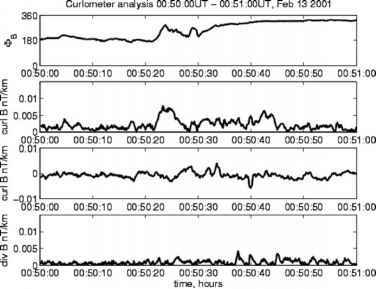 Heliospheric current sheet timing analysis. Directions are with respect to the GSE coordinate system. Figure 1.7. Curlometer analysis for the duration of the HCS encounter by Cluster. Top panel: Change in indicating the slow rotation in the magnetic field. Initially = 180°. Second panel: V x B in the plane of the HCS. Third panel: Component of the V x B parallel to the HCS normal. Bottom panel: Linear estimate of V • B. The current is confined to the plane of the HCS and is structured. (From Eastwood et al., 2002b). Current analysis One of Cluster's unique capabilities is that it allows the current density to be estimated directly from V x B (Dunlop et al., 1988; Chanteur and Mottez, 1993; Khurana et al., 1996). This technique is reliable only when all of the spacecraft are embedded within the current layer. From the timing analysis the thickness of the HCS is significantly larger than the tetrahedron scale size. Thus the curlometer analysis can be used. It was applied to the interval 00:50 UT—00:51 UT, yielding the results in Figure 1.7. The main current component is confined to the plane of the HCS discontinuity. Note that the orientation of the HCS is calculated independently of the current vector. Moreover, the current structure in the second panel displays substructure. The current density is bifurcated, peaking at both sides of the layer at V x B = 0.01 nT km—corresponding to a current density of 10—8 A m—2. The peak current may be compared with the 0.5-1.5 x 10—8 Am—2 of the single spacecraft analysis. Magnetic holes For completeness we mention that crossings of the HCS frequently show the presence of'magnetic holes (see, Burlaga and Lemaire, 1978; Fitzenreiter and Burlaga, 1978; Turner etal., 1977), sometimes referred to as D Sheets. These are dropouts in the magnitude of the main magnetic field. There appear to be several 'species of magnetic holes in the solar wind; relatively short duration holes are thought to be associated with mirror modes (cf. Section 1.3.1). Longer-lasting magnetic holes were described first by Burlaga and Lemaire (1978). Recent theoretical work and simulations (Roberts et al., 2002) suggest that magnetic holes may naturally accompany the HCS and arise from dynamical forces associated with the necessity of maintaining pressure balance between the HCS, HPS and the surrounding fast solar wind. 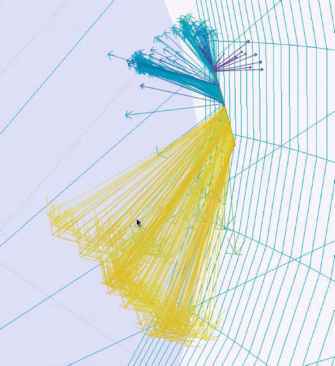 Cluster should, in principle, be capable of investigating the very structure of such magnetic holes during passages like the one in Figure 1.8 which shows the rotation of the magnetic field on February 13, 2001, near 00:50 UT. The magnetic field direction is indicated by the arrows and the magnitude is indicated both by the (rainbow) colour and by the length of the arrows. A systematic search for magnetic holes using Cluster observations is underway. Conclusion We have used multi-spacecraft techniques made possible with Cluster to investigate and describe properties of the HCS. In particular, the four spacecraft allow for estimates of the current density using the curlometer technique that employ fewer assumptions than were necessary using data form single spacecraft. From the case study described above, we were able to conclude that the HCS was a tangential discontinuity with a bifurcated current structure that had a peak current density of 10—8 Am—2. This observation of the HCS indicates that it is a slowly moving planar transverse current layer that is several 1000 km thick. Clearly more statistics are required before one can conclude that the HCS is generally a tangential rather than a rotational discontinuity. Which has important implications for stability with respect to magnetic reconnection (Smith, 2001). Figure 1.8. A view of the HCS crossing on February 13, 2001 showing the magnetic field (coloured by |B|). Note the rapid rotation of the magnetic field followed by further rotations and a decrease in magnitude (dark blue). The picture was made using the visualisation software package 'Visbard'. Figure provided by M. Goldstein and D. A. Roberts. 1990) when it travels into the heliosphere at super-magnetosonic speeds relative to the ambient solar wind, driving an ICME-associated bow shock that is typically observed shortly before onset of the ICME itself. In general, about 1/3 of all ICMEs have the large-scale rotation and other properties of magnetic clouds. The relationship between ICMEs and magnetic clouds has been investigated by Gopalswamy etal. (1998). The orbit of Cluster is not in the solar wind long enough to observe an ICME or magnetic cloud in its entirety, and the separation of the Cluster spacecraft has been too small so far to allow for a multipoint analysis of their geometric properties. However, Cluster can be used to study the properties of the shock and sheath regions of an ICME. Furthermore, the properties of small-scale magnetic flux ropes (Moldwin et al., 1995, 2000) with durations of tens of minutes, can be analysed by Cluster. Figure 1.9. Flux rope observed by ACE in the solar wind between 12:00 UT on March 27, 2001 and 12:00 UT, on March 28, 2001 (day 86 on March 27). The top three panels show the Cartesian components of the magnetic field in GSE. The middle three panels show a the same data in polar coordinates. Overplotted in red is the magnetic field profile of a double flux rope model. 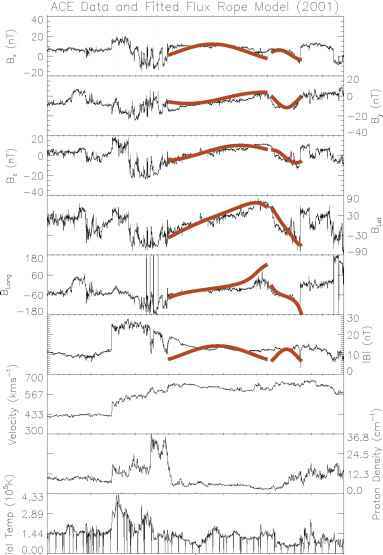 The bottom three panels show plasma velocity, density and radial temperature. (From Rees, 2002). ICMEs (and magnetic clouds) are common large-scale interplanetary structures. During solar minimum they are often isolated, but during solar maximum they frequently overlap. To understand the macroscopic structure, evolution, and dynamics of the solar corona and heliosphere, it is important to understand how ICMEs are structured and orientated. ICMEs are also important triggers of geomagnetic activity. The mechanisms for their interaction with the magnetosphere depend critically on their large- and small-scale magnetic structure. For example, the prolonged intervals of southward IMF at Earth that cause large geomagnetic disturbances (Richardson et al., 2001) are often found to be related with the passage of ICMEs. Approximately 1/3 of ICMEs are associated with a magnetic flux rope structures that can be modeled as a force-free helical magnetic field configuration (e.g., Burlaga, 1988)-these are commonly referred to as magnetic clouds. This magnetic flux rope model provides the orientation axis of magnetic clouds, but for those ICMEs that are not magnetic clouds, alternative methods must be used. One approach is to use the fact that ICMEs move supersonically relative to the ambient solar wind. In the ICME frame of reference, the solar wind flows across the ICME bow shock, where it is slowed, deflected, heated and compressed. The sheath plasma is then draped over the ICME, which is thought to lead to the formation of planar magnetic structures consisting of ordered sheets of magnetic field. These may be visualised as a stack of plasma sheets, separated by tangential discontinuities (Jones et al., 2002). The normal of each individual planar structure is aligned with the normal of the ICME's leading edge. The orientation of the leading edge, which itself is perpendicular to the axis of the ICME, can be inferred by analysing the orientation of the planar structures. This alternative analysis method can be tested by looking at ICMEs that contain a flux rope. Such a magnetic cloud was observed by ACE on March 27 — 28, 2001. Figure 1.9 shows the properties of the solar wind plasma and magnetic field as measure by ACE [Rees, Ph.D. Thesis, University College London, 2002]. 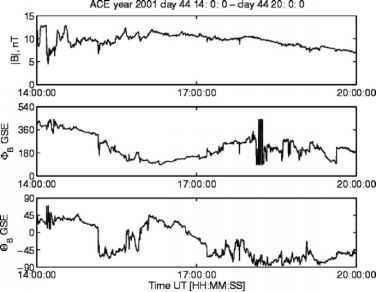 Initially, ACE observed the relatively unperturbed solar wind. The ICME-driven shock was observed after 17:00 UT on day 86, indicated by the simultaneous jump in magnetic field strength, density and velocity. The ICME itself, defined by the relatively low density and smooth magnetic field rotation, starts after 22:30 UT. The interval between these two times, characterised by particularly high plasma densities, corresponds to the upstream sheath region of the ICME. In Figure 1.9, the magnetic field profile of a flux rope model is plotted in red, assuming cylindrical symmetry. Although it is a single structure, it is best modeled as a double flux rope. The axis of the trailing rotation was found to be (0.32, 0.93, 0.21) in GSE coordinates and the axis of the leading rotation to be (0.93, 0.08, 0.37). The axis of the trailing rotation is consistent with properties of typical flux ropes, however, the axis of the leading rotation is primarily aligned to the solar wind flow, which is unusual (A. Rees, private communication). Figure 1.10. 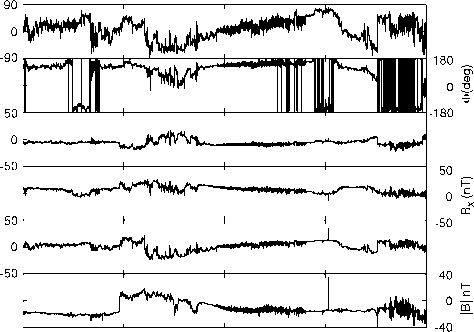 Magnetic field observed by Cluster 1 in the solar wind for the same time interval as Figure 1.9. The spike after 06:00 UT is a shock encounter. Enhanced fluctuations are foreshock-related. (Figure provided by T. Horbury). Figure 1.11. Small-scale magnetic flux rope observed by ACE on February 13 (day 44), 2001. The magnetic field is shown in polar (GSE) coordinates. Note that is wrapped over above 360° at the start of the interval. (Adapted from Eastwood et al., 2002b). a circular cross section. While the exact interpretation relevant to this example has not been resolved fully, it illustrates how Cluster can be targeted to certain problems and can be used to augment single spacecraft analyses. A second class of flux rope structure with much smaller transit times (a few hours) has also been identified, after occurring in the vicinity of HCS crossings. These ropes have been termed 'small scale magnetic flux ropes (Moldwin et al., 1995, 2000). 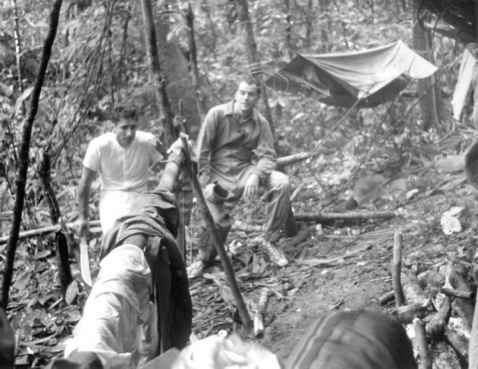 Moldwin et al. (1995) explored the stability of the HCS with respect to reconnection across the HCS generating small scale magnetic flux ropes. However, structure in the vicinity of the HCS may also be due to transients (particularly ICMEs) distorting, or locally replacing, the HCS (cf., e.g., Crooker et al., 1998). Eastwood et al. (2002b) used Cluster and ACE observations to examine how the properties of a small scale magnetic flux rope change when interacting with the terrestrial bow shock. The observations were made on February 13, 2001, shortly after the HCS encounter discussed previously. A few hours after the HCS, both Cluster (by that time located in the magnetosheath) and ACE observed a 'small scale magnetic field rotation, lasting for a few hours.